With the arrival of October, summer is officially over and the autumn season has begun. 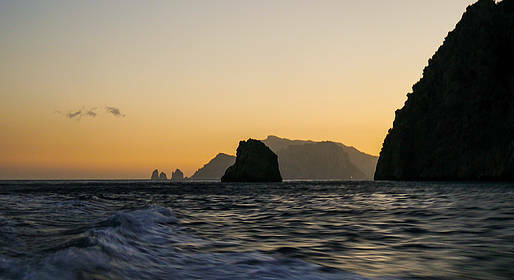 This is the perfect time of year to visit the island of Capri and Amalfi Coast, since you can take pretty much any day trip from hiking the island and coastal paths to exploring by sea...all with mild temperatures, limited crowds, and a more relaxing pace. On Capri and the Amalfi Coast, most hotels and restaurants close at the end of the month. Beach clubs close for the season in mid-October. The weather is quite pleasant through the middle of the month, with sunny days and warm temperatures. The sea is still warm from the summer sun, so you can often swim. Usually in October it is quite warm during the day, while it can get decidedly chilly at night. The most appropriate clothes are jeans, a light sweater, and a jacket. You may want to pack something waterproof, in case you catch one of the frequent autumn rains. There are many things to do in October, from beach days to hiking the mountain peaks. Beaches: if you visit during the first half of the month, you can enjoy the quiet beaches and warm sea. Beach clubs generally close after the second weekend of the month. Hiking: Temperatures are cool enough now to comfortably hike, but keep an eye on your watch so you are sure to be back before the sun sets as the days are shorter in fall.